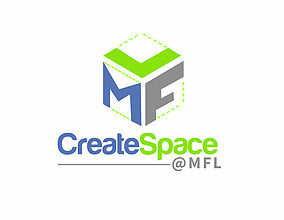 CreateSpace@MFL was launced in January 2014 as a pop-up makerspace & digital media lab in the Middletown Free Library. The project was funded through an LSTA Creation Grant awarded in the fall of 2013. Due to space limitations in the library, the space was designed to be portable so we can take our programs and tools out into the community or even set up in a small corner of the library. We are currently the only space of this kind that is open to the public in Delaware County. Library of Things including items such as MakeyMakey, littleBits, Ukulele, Cajon, Wacom Tablet and more! Programming is a key component of CreateSpace@MFL. We offer a variety of workshops, after school and summer programs for people of all ages. Check out our Library Programs page for upcoming workshops and programs. Our programs have been recognized with awards as well as chosen as topics for presentation at statewide and national conferences. Want to learn how to use the 3D printer or do you have an item you would like to print? Contact us or visit us at the library to set up an appointment today!